Per the instructions in the linked recipe above, preheat oven to 400 F degrees. In a large sauté pan, sauté onions and garlic in canola oil on medium heat until they soften, with a sprinkling of sea salt. Add carrots and celery. Cook for a few minutes. Add vegetable broth, soy milk, and flour, to thicken sauce. Add bay leaves. Add frozen peas. Add chicken breast. Add additional salt and pepper to taste. Cover and lower heat to simmer until chicken breast is cooked through and sauce thickens. Lightly oil casserole dish with canola oil. Cut chicken in cubes and transfer to casserole dish. Pour vegetable mixture over chicken in casserole dish. Per the instructions in the linked recipe, mix the flour, baking powder and salt in a food processor. Once mixed, add the Earth’s Balance margarine and use food processor to mix until the entire mixture becomes crumbly. Then, while the food processor is still mixing, add the soymilk through the top until the entire mixture forms a dough. Spread dough out over filling in casserole pan. Bake for approximately 35 minutes. Pastry top should brown nicely. 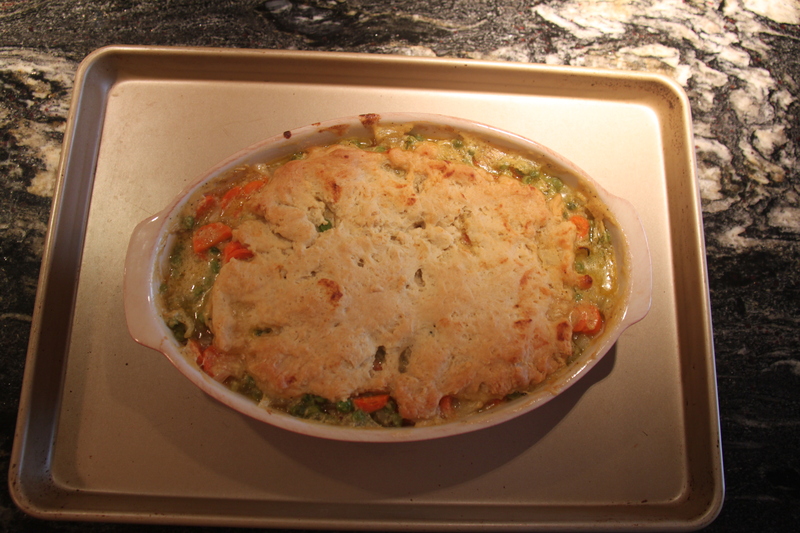 I also put the whole casserole pan on a baking tray so that to the extent the pot pie bubbled over, it landed on the tray instead of the stove — easier clean up!